AgroAtlas - Relatives - Vavilovia formosa (Stev.) An. Fed. - Vavilovia. Vavilovia formosa (Stev.) An. Fed. - Vavilovia. Family Leguminosae Endl., genus Vavilovia An. Fed. Alophotropis formosa (Stev.) Grossh., Orobus formosus Stev., Pisum aucheri Jaub. et Spach., Pisum formosum (Stev.) Alef., Vavilovia aucheri (Jaub. et Spach.) An. Fed., Vicia aucheri Boiss. Perennial herbs. Height 5-15cm. Sprawling or creeping. Surface glabrous. Spines absent. Stem not winged. Leaves paripinnate, with terminal mucro. 2 leaflets per leaf. Leaflet shape obovate or cuneate to ovate or cordate; margins entire; lamina glabrous. Stipules small and/or inconspicuous, foliaceous, free from petiole. Flowers usually solitary; axillary. Pedunculate. Corolla pink or purple (keel may be white). Standard often oblong, claw short and broad; wing falcate to oblong; keel blunt; wings longer than keel. Calyx campanulate, teeth subequal. Bracts small and/or inconspicuous; bracteoles absent. Stamens monadelphous or diadelphous. Anthers smooth and glabrous; dehiscent. Pod length 20-35mm. Seeds globose; 3-5 per fruit. Cross-pollinated. 2n =14. Central and Eastern Caucasus. Grows in some isolated habitats (Karachevo-Cherkessia, Cabardino-Balkaria, Northern Osetia, Dagestan, Azerbaijan, Armenia and Georgia). Species with disjunctive area. Introduced into Red Book of the USSR. Typically found in high-mountain areas (2650-3200 m) on shale or rocky ground. The unique perennial representative of Pisum genera, reveals the evolution of the genera. 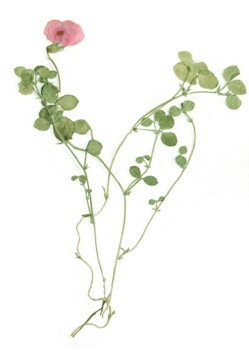 Vavilovia is of scientific interest as a source of a perennial gene that could be potentially be transferred into closely related Pisum material. Brezhnev D. D., Korovina O. N. 1980. Wild relatives of the cultivated plants of flora of the USSR. - L.: Kolos, 376 pp. (in Russian). Flora of Azerbaijan, 1954. Carjagin I. P. (ed.). Vol. 5, Baku: AN Azerb. SSR, 580 pp. (in Russian). Flora of the USSR, 1948. Schischkin V.K., E.G. Bobrov (ed.). Vol. 13, M.-L.: AN USSR , 588 pp. (in Russian). Galushko A. I. 1980. Flora of Northern Caucasus. A field guide. - Rostov - na - Donu:, Vol. 2. - 350 pp. (in Russian). Grossheim A. A. 1952. Genus Vavilovia An. Fed. Flora of the Caucasus. M.-L.: AN USSR, v.5 - p. 414 - 416. (in Russian). Kolakovskiy A. L. 1958. Flora of Abhasiya. - Tbilisi:, Vol. 3. - 292 pp. (in Russian). Vahromeeva M. G., Pavlov V. N. 1990. Plants of Red Book of USSR. - M.:, Pedagogika, 240 pp. (in Russian). © Photo Dzyubenko N. I.